Oh my it’s getting chilly…let’s make comfort food! For the last couple of weeks, the pool heater at work has been broken. Fortunately it was fixed today but the air temperature was cold. So after two and a half hours in the water, I was very glad to be finished work and in a hot shower today. Swim teaching in terms two and three can be somewhat unpleasant if conditions are not up to scratch. Somehow, my feet just haven’t thawed yet. And don’t even start me on people who send their children to class complete with yellow snot. Not cool people. All of which calls for comfort food. Lucky, because that is exactly what I had planned for tonight. Let me tell you, the schnitzel and mash were good, let’s face it, they just are. The salad though, now that was something else. Simply stunning. Sometimes that lil ol’ brain of mine hits up on a winner and tonight was one of those nights. Make the salad, I promise you won’t regret it. It doesn’t even need the dressing, nice though the dressing was. If cut carefully, 2 large chicken breasts should be ample for 4 people. Really. Trust me. Don’t fall into the very expensive and not overly healthy western habit of eating too much meat. Cut each chicken breast into 2 separate fillets. Hammer flat with the unridged side of a meat mallet. Set up your crumbing production line. On the first plate, flattened chicken pieces. Plate 2, flour for dusting. Then a bowl, lightly beat egg and combine with milk. Then another plate with breadcrumbs combined with dried herb. 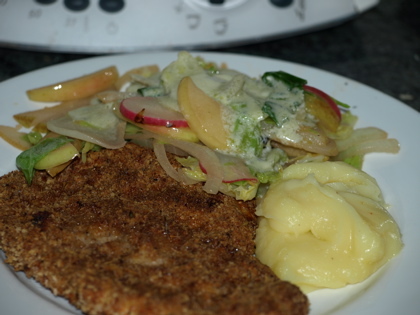 Finally, a plate for completed schnitzels. Now work the chicken pieces through the production line. Dust with flour, coat with egg, cover with crumbs. When ready to cook, set up a wire rack over a baking dish. 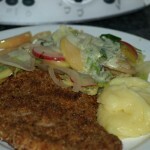 Spray each side of each schnitzel with oil, place on wire rack and bake for about 30 minutes. Done. Just as delicious as pan fried and a whole lot healthier. Melt butter in fry pan, add salad ingredients and lightly stir fry until cabbage has just wilted and everything has been tossed through the butter and warmed. Remove from heat. Combine cheese and vinegar then gradually whisk in oil. If using thermomix, combine cheese and vinegar for 10 seconds on speed 4. Insert butterfly and gradually pour in oil while mixing on speed 4 over 1 minute.